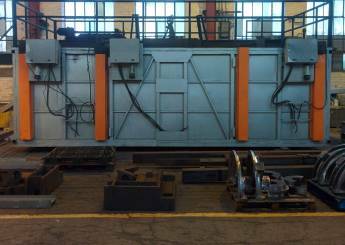 Our in-house electric stress relieving oven has the capacity to cope with heavy steel fabrications. Its large size means we can fit fabrications or plates up to 6.2 metres long by 2.6 metres wide & 1.8 metre high with a maximum weight of 15 tonnes. Being a 3 zone electrically fired thermal stress relieving oven allows us much greater temperature control over the post weld heat treatment process than gas fired or other furnace types. 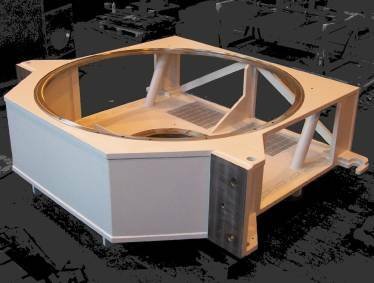 This type of thermal stress relieving oven also produces less scale on the fabrications due to there being significantly less oxygen present during the firing. We normally fire 5 nights a week & most weekends, which can accommodate longer soak time items or be set to customer specific temperatures. Our oven is fully calibrated in all 3 zones & for each 'furnace batch' we can supply a calibrated heat cycle chart to ensure soak times and temperatures have been achieved & to ensure that steel and welds have been adequately stress relieved. For a quotation on subcontract stress relieving, please contact our finishing division Radleigh-Nash. The key to high quality paint finish is the preparation, if the steel hasn’t been properly prepared no amount of paint will give you a long lasting finish. Blasting in-house allows us to inspect the fabrication before paint to ensure that all the scale has been removed and that the paint has a good clean substrate to adhere to. 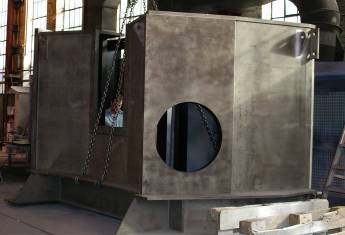 Our shot blasting capacity can cover some 13M in length x 6M wide x 6M high. We have a range of booths that use both chilled cast iron shot and aluminium oxide/bauxite abrasives. We regularly take on subcontract shot blasting of all shapes and sizes, from 1 kilo to 16,000 Kilos. For more details on spec or for a quotation on subcontract shot blasting, please contact our finishing division Radleigh-Nash. We know that the paint finish is the first thing that your customer see, this is why we take great pride in striving to achieve the highest possible finish. Our two 'Wet Spray' painting booths can accommodate all variations of paint finish required. From a standard one pack primer to offshore 5 coat systems… we have it all covered. Our paint shop personnel are highly experienced in all types of coatings and we are more than sure you will not be disappointed with the level of finish achieved. We have accounts with all major industrial paint manufacturers, but we can also work on a free issue paint basis if preferred. Both dry and wet paint film testing can be carried out to suit your requirements. For a quotation on subcontract painting, please contact our finishing division Radleigh-Nash. 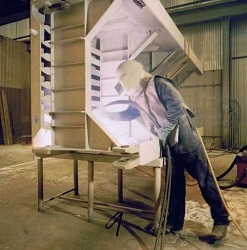 Thermal spray coating is ideal for smaller and intricate parts as well as large fabrications and structures and can act as a replacement for galvanizing, specifically in the form of hot zinc spraying. It is often used on very large bridge structures and lighting columns. Metal Coating (also known as Thermal Spraying) is used for the bonding of hot Zinc, Aluminium or various amalgams to blast cleaned surfaces. For a quotation on subcontract Thermal Spraying, please contact our finishing division Radleigh-Nash. 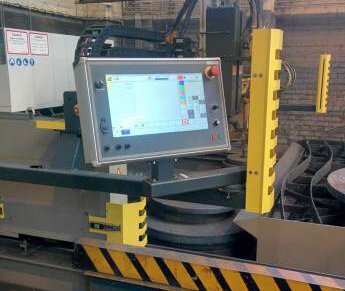 Our in house ESAB CNC steel profiler allows us to cut accurate flame cut blanks from between 6mm to 200mm. We carry a wide range of steel plate sizes in stock in both S275 and S355, so if it's a one off small part to a full sheet cut we can help you out. If you only require a few parts we can normally add them to one of the nests that we are currently cutting saving you money. For a quotation on subcontract steel profiling, please contact our sales team. Wet spray filtered extraction booths. Thermal Spraying filtered extraction booths.